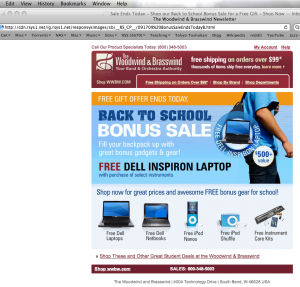 Free Laptop or iPod with an Instrument Purchase? Say What? I’m not too sure who came up with this at the Woodwind and the Brasswind. But seriously, is this the only way to sell instruments now? You have to give them an iPod or a Dell laptop? Why not just lower the prices? I know the markup on a lot of these, and it is HUGE. Why not cut the prices and make maybe 10% profit rather than 90%? Greg Fishman has a number of excellent books out. I’ve reviewed and highly recommend his Jazz Etudes Book Vol. 1 and Vol. 2 and his Saxophone Duets book. 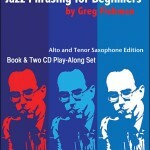 His latest book is Jazz Phrasing For Beginners, which is aimed at the beginning student. It contains 10 melodic tunes that great examples of idiomatic “classic” jazz tunes such as “C Jam Blues” and the like. The tunes are great studies in good voice leading and use of jazz rhythms. Also great motivic (or sequential) development. You get 2 CDs with the book. One CD that has Alto Sax demos and backgrounds, and one that has Tenor Sax demos and backgrounds.